The Roy Rogers - Dale Evans Collectors Association is a non-profit, charitable organization staffed by all volunteers. Money is set aside for a sizable donation to the Roy Rogers Scholarship Fund, which helps a student attend Shawnee State University in Portsmouth, Ohio. The scholarship fund is handled by the Scion Foundation. Our mission is to share the love of American Cowboys, Cowgirls, Indians, and heroes. Where the good guy always wins and for a good cause. We aim to perpetuate all the things the King of the Cowboys stood for and to keep his name alive. Hopefully, with your support, we can share all the goodness of life and let His light shine through. In 1981, the Portsmouth Area Community Exhibits (PACE) was founded as a nonprofit, charitable organization for the purpose of honoring local people for outstanding accomplishments and to provide forums and exhibits to honor those people. During that first year, the board members of PACE researched the names of accomplished local people and created a list of 97 people who had distinguished themselves beyond the local community. The fields of endeavor for those people seemed as long as the list itself. There were artists, authors, actors athletes, inventors, politicians, musicians, singers, educators, and corporate leaders; and the list goes on. In that first year, we began to honor people by holding award banquets for several of them at a time. Two of the people on our Famous List stood out as national and world-renown individuals. They were Roy Rogers and Wesley Branch Rickey. All Roy Rogers fans are aware that he grew up in Southern Ohio on a modest farm only a few miles from the spot on Duck Run where Roy and his family built their home. In 1982, we decided that our "number one" famous person should have special recognition, so we formed the Roy Rogers-Dale Evans Collectors Association (RR-DECA) and began planning an annual event. We collected over 10,000 signatures from local people, bound the signatures in a huge album, and sent a delegation with the album to Victorville, CA to meet with Roy, inviting him to a homecoming in Portsmouth, Ohio. The homecoming took place in the fall of 1984. The Roy Rogers Festival (RR-DECA) began. 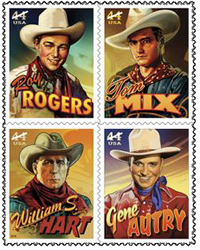 On April 17th 2010, the United States Postal Service issued a special commemorative postage stamp to honor Roy Roger, the King of Cowboys, and three other Cowboys of the Silver Screen; Tom Mix, William S. Hart, and Gene Autry. These stamps were sold at the 2010 Roy Rogers Festival. 2018 marks the 35th anniversary of the Roy Rogers Festival, and this will be our year to really SOAR. We are so happy to have you share this special time with us. ~ Trails of Happiness - From the Board of Directors and Committee.